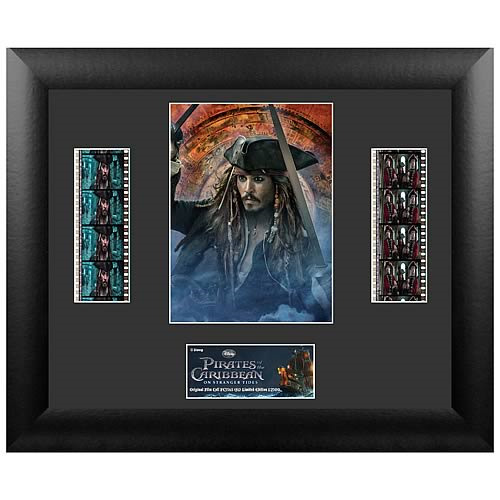 Features a print and actual cells of film from Pirates of the Caribbean: On Stranger Tides! This amazing series 1 double film cell features prints and actual cells from Pirates of the Caribbean: On Stranger Tides. Measures 11-inches tall x 13-inches wide. Perfect for displaying in your home or at the office, all the elements are framed in black wood and includes a certificate of authenticity. Order yours today! Johnny Depp returns to his iconic role of Captain Jack Sparrow in an action-packed adventure. Crossing paths with the enigmatic Angelica (Penelope Cruz), he's not sure if it's love - or if she's a ruthless con artist who's using him to find the fabled Fountain of Youth. When she forces him aboard "The Queen Anne's Revenge", the ship of the legendary pirate Blackbeard (Ian McShane), Jack finds himself on an unexpected adventure in which he doesn't know whom to fear more: Blackbeard or Angelica, with whom he shares a mysterious past.